Following a BBC analysis of departures in the summer season of 2016, we can tell you which UK airports you’re most likely to be delayed from this summer – if last year’s figures are anything to go by. Please note that the figures do not include cancelled flights. Last year, 38,000 of 199,000 international flights from UK airports over the peak holiday period were late. The average delay was 21 minutes, and most delays happened in June. 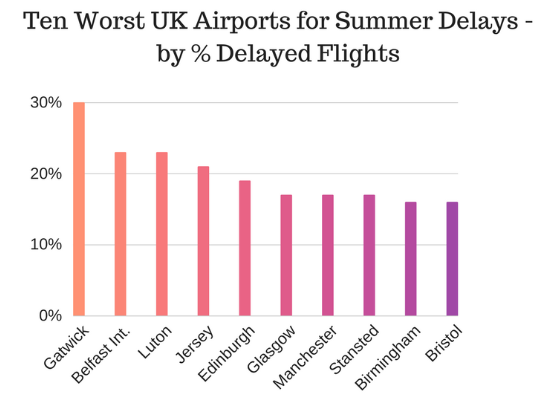 Most delayed flights departed from London airports, although Heathrow proportionally didn’t do too badly, not making the list of the ten worst. Overall, airports serving European airports tended to do a lot worse, due to disruption in Europe from factors such as air traffic controllers strikes and heavy air traffic congestion. Three quarters of the most delayed routes were serving European airports. Please see below for the ‘top ten’ worst UK airports to depart from over the summer.